An interesting premise and some creative ideas, get bogged down by a movie that just moves a little too slow, and takes too long to get at what it’s trying to say. This is is a movie with a very simple premise that actually works because of how straight forward and basic it is. We have the story of a man who is told that his wife is cheating on him, and goes into immediate denial. Alfered spends the first half of the film refusing to believe the truth, despite more and more reasons presenting themselves, that should be convincing. Then in the second half, Alfered starts imagining different possibilities for his future. And then, after three scenarios play out in Alfered’s head, we finally get the real conclusion. The ideas are interesting (especially the way that the movie doesn’t let us know that the first imagining is fake, for quite a while,) but the pace is just too slow. Everything takes way too long to happen, and the audience is constantly ahead of both the main character and of the movie. 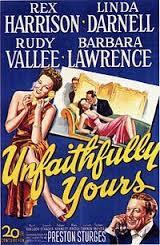 Unfaithfully Yours is a movie that says a good amount of what it will be about, right there in the title. It’s about a married person being unfaithful to his or her spouse. And we figure out pretty early on that it’s going to be the woman who is unfaithful. That’s because the man, Sir Alfred, is completely head over heels in love and devoted to his wife. He worships the ground she walks on and he’s also too busy, as a conductor of a giant symphony orchestra, to focus on anyone or anything else. And yet, despite giving away this plot element in the title, the movie takes a very long time to tell us that Alfred’s wife has been unfaithful. The first ten minutes or so are pretty much just about the orchestra and Alfred and his happy relationship with his wife. The film opens with a long orchestra scene, showing each of the musicians at work before panning up to Alfred as he conducts the whole number. The shot might be impressive, in an artistic tracking shot kind of way, but the whole scene is too long, and makes us say, “Get to the point already,” or at least, get to the plot. And unfortunately that’s the exact same problem plaguing the movie even after the orchestra scene. Alfred takes forever just to even listen to someone tell him that his wife is being unfaithful. About three different people try, including a detective agency. Every time this happens, Alfered refuses to listen. When an envelope arrives with photos of proof, he lights it on fire before looking inside. He does all this and then he’s surprised when he finally does find out that his wife has been cheating on him. I understand the denial, but then to later act surprised is pretty ridiculous. It’s a classic mistake for a movie to have the audience knowing more than the main character, and an even bigger one to have things go on this way for a long time. The audience keeps saying, when is he going to catch on already? Maybe it’s supposed to be funny, that this guy just doesn’t see it, even when it’s right in front of him. But more often this just comes off as annoying. It’s trying the audience’s patience, and that’s not much fun at all. Luckily the movie gets better. A lot better. Once Alfred finds out the truth, he starts imagining what he’s going to do. Only we don’t know he’s imagining it. Not the first time anyway. It’s the night of his big show and he’s on stage performing and suddenly the camera zooms into his eyes until the screen is all black, and now we are with Alfred and his wife as they return home from the concert. He convinces her to go out with the man who he believes she is having the affair with (his secretary), and she agrees. The man arrives at the door, but not before Alfred has violently killed his wife. Normally I would suspect this as being fake, like in the character’s head, but the movie Scarlet Street taught me to never under estimate the dark places an older movie is willing to go. A movie today wouldn’t dare try something like that film did. A movie today would never do what the movie Psycho did, killing off the main character only halfway through the film. But back in the old days, they were all a little nutty, and did things that took real guts. And so yes, when Alfred started slashing up his wife, I thought that any second they would show him just sitting there, with her standing next to him, and show that it was all in his head. But when this didn’t happen, I actually started to believe it. Alfred now goes about creating an elaborate setup where he records his wife’s voice screaming, and shouting out the name of the man she is having the affair with. He then lets the man in, and gets this fellow to put his hands on the murder weapon without realizing it. All of this leads to the police coming in and arresting him and then the man being put on trial and sentenced to death, all while Alfred stands there, in the court room, watching and laughing. 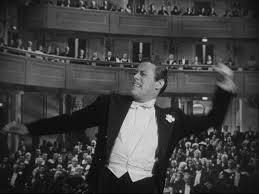 And then we pull back on Alfred, back at his podium; still conducting the concert, to realize it was all in his head. And two more scenarios follow it, each one beginning with the camera zooming in, right into Alfred’s eye. The next scenario has Alfred tell his wife that he understands her going off with another, much younger man, “Youth belongs to youth,” and even giving her money to do so. And the final scenario has him challenge the young couple to a game of Russian roulette. Alfred goes first and ends up blowing his brains out. But none of these storylines are the real scenario. The real one finally happens after the third imagining. Just like the beginning of the movie, it ends up going on a little too long, with Alfred tripping over all kinds of things as he tries to setup his apartment a certain way. He makes a huge, annoying, mess of the place, and that leads us into our final act. Unfaithfully Yours is pretty simple and straight forward, and in those areas it works. The first half is about Alfered, a man who is as naive as they get, eventually learning the truth about his wife. The second half is about the situations that Alfered imagines happening afterwards. I like the multiple scenario imagining possibilities. It reminds me of the endings to Clue, “here’s what could have happened…and here’s what really actually happened.” I like the way that in the first telling of the story, when Alfered kills his wife and frames her lover, we don’t know that it’s all fake. All of this is great. But the movie takes too long to get going, and nearly falls into the same trap again, by it’s end. It definitely has some good ideas and some creativity, but would have benefitted from a quicker pace, that didn’t play on the audiences nerves.